This Wednesday in Holy Week has been for me a time of preparation. Mostly preparation for the barrage of preaching that will soon be upon me. And preparation also in this sense: prayer, reflection, silence, reading, study. I desire to enter deeply into this week and its significance for me, for the people I serve, and for the world. Even in times of preparation, the world does not stop. I had lunch with colleagues, spent some time at the office attending to things that others might need from me, and running a few errands, reminders of the the daily-ness of living. Tonight’s evening prayer service was also a time of preparation. This was the last night we gather before The Great Three Days begin. The lessons we read continued to point us to those events and to ready us to enter into them. Tonight’s lesson took us to the upper room — the same setting as tomorrow’s footwashing and Last Supper. Tonight the reading was still preparation for the main event. Jesus looked around the table and saw one who would betray him. Our Director of Youth Ministry reflected for us on this lesson and mentioned her own fascination with Judas and the place he plays in this Holy Week drama. While we might be tempted to fixate on this tragic character and his motives, she reminded us that it still is all about Jesus. Jesus, the author and perfecter of our faith, is himself preparing to reveal fully God’s gracious presence among us. Only it won’t be with angelic choirs in the sky; it won’t be in the waters of the Jordan with a voice booming from the clouds; it won’t be on a mountain with glowing clothes or transfigured appearance; it won’t be in miracles of multiplication or in the healing of the lepers and the lame. It will be on a cross. For that profound moment, dear God, prepare me. 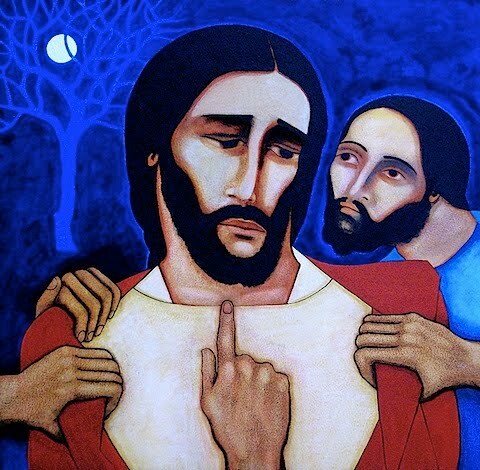 This entry was posted in Uncategorized and tagged Holy Wednesday, Preparation on April 16, 2014 by Jim Honig.